Hotels in Gatlinburg decorate for fall in spectacular fashion. This year, Zoder's Inn and Suites entered the Harvest Festival décor contest for the first time – and won! Their theme? “Pursuing the Pumpkin Patch In Search of the Perfect Pumpkin.” And perfect pumpkins they were. Painted by a relative of Head Housekeeper Shirley Stuart, these pumpkins were spread all over the six-acre Gatlinburg resort. Stuart, along with Head Maintenance Man Bobby Ramsey, were instrumental in putting the decorations together. “I'm very pleased that we got first place, especially because we entered for the first time,” shared Zoder's Inn General Manager Jamie Holland. Was she surprised? “[I know] the work that was put into it, and the pride we had, the feedback we received from the guests, the TripAdvisor testimonies... No, we were not surprised,” she laughs. 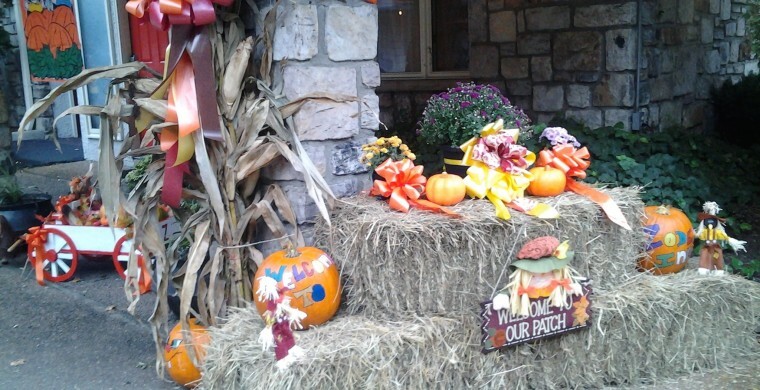 These fall decorations, whether at Zoder's Inn or elsewhere, are elaborate enough to become Gatlinburg attractions in and of themselves, by the way. Tourists sit on hay bales and smile into cameras. Children pat pumpkins bigger than themselves. The elderly touch the corn on the stalk as if to reminisce about their farming parents. Among all the things to do in Gatlinburg, during the fall, checking out the decorations should be at the top of your list. Among all the Gatlinburg resorts, Zoder's Inn should be at the top of your list, too. Friendly staff, balconies overlooking the Roaring Fork River, cookies and milk at night – what's not to love? We even think that Caesar, our 35-year-old parrot and mascot, should be listed as one of the Gatlinburg Tennessee attractions. This bird can say “hello,” “meow” and “bye” with a Southern accent. He sits in his cage and yes, he bites, but, if you keep your distance, you can even take a selfie with Caesar in the background. So as fall rolled around, Holland set the goal of entering the Harvest Festival and winning first place. Bull's eye!